Strawberry spinach seeds – How to grow Strawberry spinach from seeds? Is it recommended to grow Strawberry spinach from seeds? 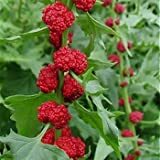 Strawberry spinach seeds need: moist soil, cool weather without frost, full sun, in the autumn – frost free area / spring – temperate climate. Strawberry spinach seeds it’s the best way to start to grow Strawberry spinach.